We stayed at the luxurious and immerse in the nature Anantara Sir Bani Yas Island Al Yamm Villa Resort that I would select as one of the best stay in the United Arab Emirates for at least 5 indisputable reasons I wrote about in a recent post. There is one restaurant in the Yamm Villa Resort area but it is possible to reach the other resorts present in the island and hence the other restaurants by boogie. The al Yamm Villa Resort is served by Olio Restaurant, an Italian dining place where breakfast is served daily. Breakfast is the common buffet with the usual share of eggs, cheeses, arabic mezze and croissants. I wasn’t particularly impressed by the food options but it was suitable for a satisfactory meal. The a la carte menu offers many options, from the classic pasta and bruschetta appetizers to wagyu burgers and more complex main courses. Quality of food is generally good, the service perfect even though it is a bit pricey. The wagyu burger meal is massive. The patty wasn’t as good as I expected and was difficult to digest. The paccheri pasta with duck ragout was exceptionally good. This trofie pasta with pesto and seafood were interesting. This recipe from Liguria was well prepared by the chef. In order to escape the daily routine, we organized a transport to Amwaj restaurant. It is a 10 minutes drive from Al Yamm resort and we had no problem at all in organize it. the restaurant is nicely furnished and is located few steps away from the beach. The menu is minimal with few seafood options inclusive of lobster, seafood, freshly caught fish and little more. We opted for some grilled fish fillet and two side dishes. The dinner was al right but a bit too expensive given the quantity and quality of food. Fish was good even though presentation was somehow lacking something. This entry was posted in Abu Dhabi, Breakfast, Burger, Italian Food, Resort, Restaurant, United Arab Emirates and tagged Al Yamm Villa Resort, Amwaj Restaurant, Dinner, Foodphoto, holiday, Italian food, Olio Restaurant, Paccheri, Pasta Lovers, Sir Bani Yas Island, Trofie, united arab emirates, Visit Abu Dhabi on February 23, 2016 by andreadetto. One of the first thing we have noticed upon entering our villa was the extraordinary view. The blue sea and the sky that you can enjoy from the comfort of your bed, the freshness of the available pool or any of the chairs, sofas or chaise lounge available. If you prefer something different, there are villas facing the mangroves area or the forest. It was surprisingly good to understand that the island is not a zoo but actually a wildlife sanctuary aiming to reintroduce into the wild some species considered endangered until few years ago. During the safari superbly conducted by our South African guide, we have learnt a lot about Oryx, Sand Gazelles, a Giraffe, Cheetahs and many other animals that are protected in the reserve and we managed to admire. Many birds, a rabbit and several sand gazelles were regularly “visiting” our villa. Whether we were sunbathing in the beach, dining at the restaurant or within the comfort of our room, we hardly heard something different from the smooth sound of the sea waves and the happy chirping of the birds. No cars, construction works or the usual noise where are daily exposed to in the city. Since the very first moment when we entered the Anantara Resort gate at Jebel Dhana Jetty, we have received a superlative service. The Sir Bani Yas Island crew was always smiling, very prepared, friendly and polite. We have never met someone from within the staff that haven’t approached us with a warm smile, a polite salutation and a request if they could have been of any help or assistance. Our villa was simply amazing. Dining room, living room, a very big bedroom, nicely arranged bathroom with cool amenities, outdoor seating and a private swimming pool (not too big though). Independent from any other villa, guaranteeing absolute privacy and quietness. There is available also an area to arrange a fire for an amazing evening. This entry was posted in Abu Dhabi, Adventure, Animal Planet, Beach, Holiday, Island, Resort, Travel, United Arab Emirates, Wildlife and tagged Abu Dhabi, Anantara, Cheeta, holiday, Oryx, Resort, Sir Bani Yas Island, Staycation, travel, UAE, united arab emirates, Visit Abu Dhabi on February 22, 2016 by andreadetto. I have recently stayed at Rixos Bab al Bahr in Ras Al Khaimah to celebrate a friend’s birthday and had fairly good stay even though with some downsides. I called the next morning and after having obtained the information I needed, I booked my room on booking.com since cheaper. The resort offers an all-inclusive package where in addition to a room you receive also unlimited drinks (selected) and buffet meals (breakfast, lunch and dinner) included in the price. However, you are not forced to have the free buffet meal at all times because there are other restaurants available for those tired of the buffet selection, for which it is requested the payment of additional 100 AED/person only. The resort is very popular among Russian tourists and Dubai’s residents especially during the weekends. When we arrived at the resort, we were warmly welcomed by the door man and then had to line up for the check-in. The hotel has 600 rooms and to handle the load of visitors checking-in at around 12.30pm there were only 5/6 people. We waited 15 minutes to check-in, a thing that the management should improve in my opinion. The girl that handled the check-in was very polite. The room assigned was no. 2554 and a polite staff member escorted me at the room located in the second building while explaining the features of the all-inclusive package and carrying the luggage. Once in the room, I recognized that the Deluxe Room with Garden View I paid for was actually with a parking and construction site view. I went back to the same girl that checked me in and asked to have another room, possibly with the Garden View I paid for. She tried to ask for a little extra for the “upgrade” but I was resolute and she politely assigned another room, this time with partial sea view, in front of the access road but slightly bigger and with a balcony. I accepted the change and the staff quickly moved my stuff and regularized my position. The premium room I got at Rixos was spacious and well furnished. The bathroom was big and equipped with all the toiletries you might need. The partial sea view from room 1438. The road is not very trafficked the balcony offers the possibility to enjoy the sunset. The resort is nice, with several swimming pools, a nice beach and very attentive and polite staff always addressing guests with a smile. There many ways you can enjoy your stay with bars and shisha places conveniently located in the common area at the center of the three buildings forming the resort. Rixos resort is formed by a common area and 3 identical buildings. The lobby and main restaurants are located at the center. The Main Restaurant y night. It is a big area that offers an outdoor veranda for smokers, inside seating and an intermediate area that is covered but with big windows. Rixos beach is very nice. The sun beds are maybe too close to each other but sand, water and staff are amazing. Between the beach and the pool there is a green area very well maintained. The buffet was good in quantity but not in quality. The same selection of cheese, salads and bread was offered at all meals and left overs of dinner were displayed the morning after. The kids’ selection was mainly a concentrate of junk food with fried chicken, fries and sausages with ketchup available. Don’t get me wrong. The food was alright but no one in our group of friends found something wow! Worth getting a second portion. After dinner, the Mojito Bar serves free mojitos (not really the best I had) and Inferno disco club gives some good time with fairly enjoyable music. Inferno’s club DJ. Fairly good music even though the club was almost empty when we were there. This entry was posted in Beach, Holiday, Hotel Review, Ras Al Khaimah, Resort, Summer Activity and tagged all-inclusive, beach hotel, holiday, RAK, Resort, Rixos Bab al Bahr, Rixos Resort, Weekend on January 31, 2016 by andreadetto. The city of Nice was founded by the Greek in 350 BC and was given the name Nikaia in honor of a victory that the Greek gained against the neighboring Ligurians (Nike is the Greek goddess of victory indeed). The city turned to be one of the most important and busy trading ports in the Ligurian sea and in the 7th Century joined the Genoese League formed by the towns of Liguria and actively participated in the wars and history of Italy. Nice fought against Genoa as an ally of Pisa, then it fell more than once into the hands of the Counts of Provence but finally remained independent even if related to Genoa. 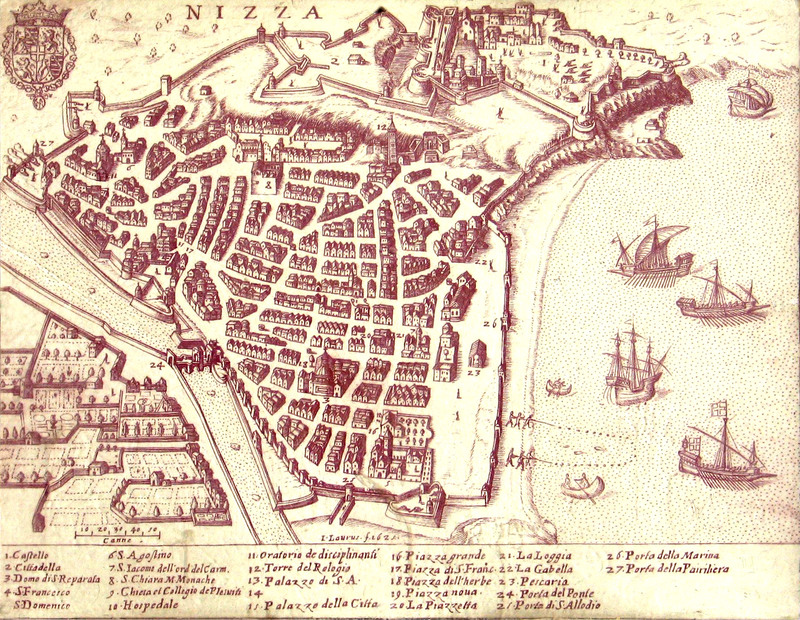 Towards the end of the 14th Century, Nice placed itself under the protection of the Counts of Savoy and it passed from French, Franco-Ottoman and Italian dominion during the successive centuries, it eventually ended to be part of the Kingdom of Piedmont-Sardinia from 1814. From 1860, after the Treaty of Turing, Nice was again and definitely ceded to France as a territorial reward for French assistance in the Second Italian War of Independence against Austria. Today Nice is the 6th most populous city in France and even though its international airport is quite small, it’s one of the most popular in the country. The runaway is off-shore and the first time I landed in this airport I thought we were landing in the sea by mistake. The organization of the airport is excellent and usually you’ll be able to pass the customs and get your luggage within half an hour. The airport has ample availability of paid parking, taxis and bus shuttles to ease pick up and drop off operations. It is perfectly located close to the “promenade des Anglais” and the highway. 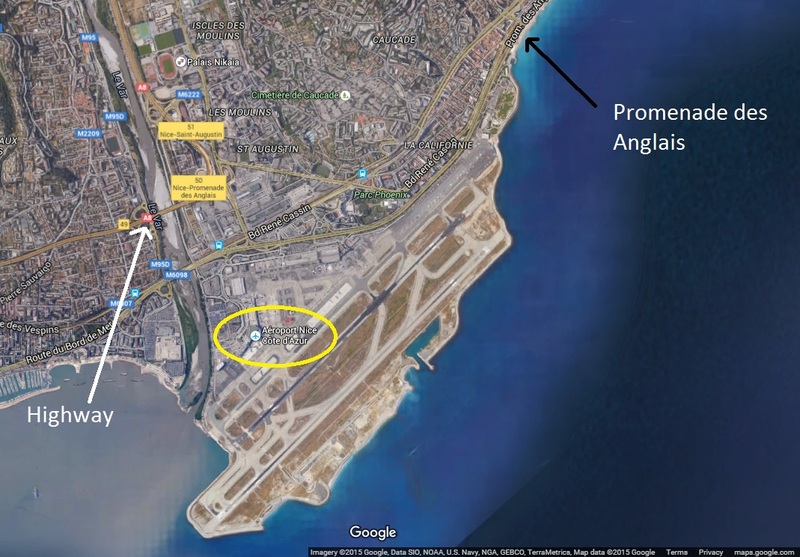 Nice Airport is perfectly located and easily accessible. The first time you land here you will be thinking to land in water! Screenshot from Google Map. Coming from the airport, at the end of the “Promenade des Anglais” there is the old town together with the ruins of the ancient castle that definitely are worth paying a visit. You might park your car (if you have a friend picking you up or you have rented one) in the numerous parking available withing the old city. They usually offer parking for free for the first hour and then they charge an average of 2 Euro per hour. The Castle Hill is a must see because from the top of the hill you can enjoy the mesmerizing landscape that the city has to offer. 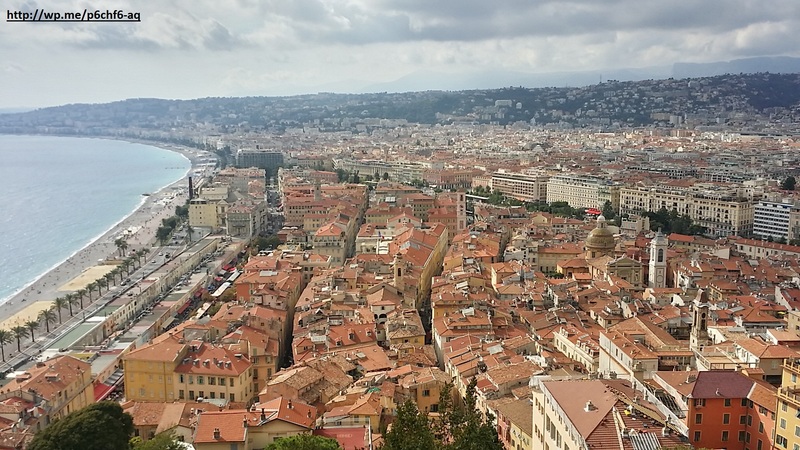 Nice Vieille Ville – Nice Old Town view from Castle Hill. 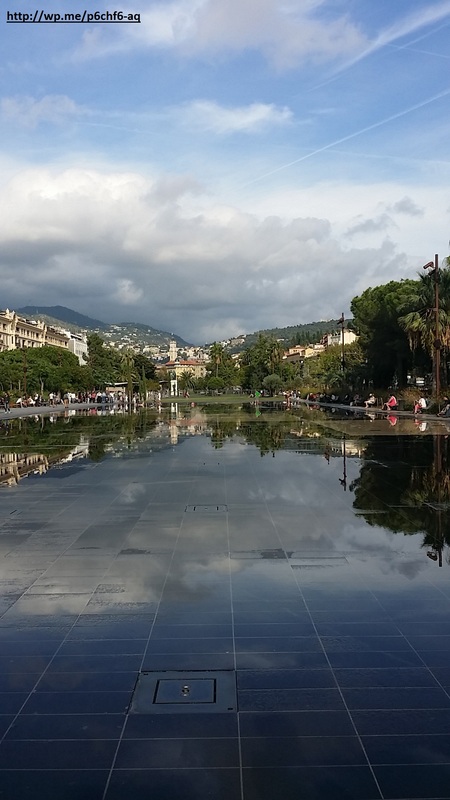 The Promenade des Anglais, literally the promenade of the English is ideal for a relaxing walk close to the beach. 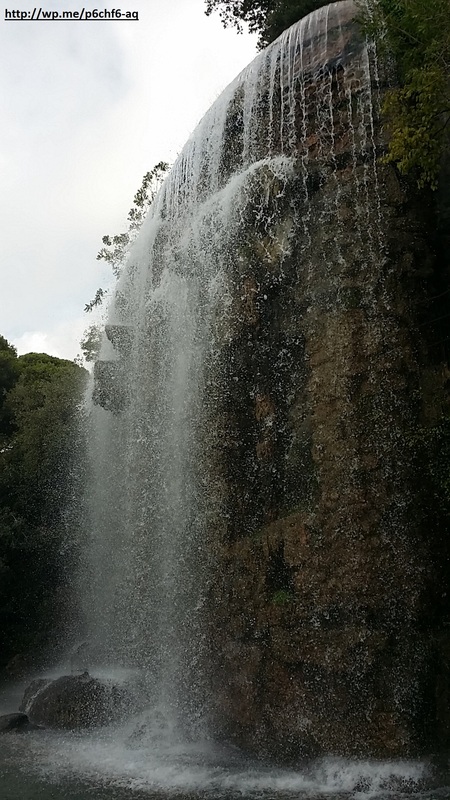 The waterfall at the Castle Hill is very popular with visitors. The old town offers many things to do: shopping, dining, historical exploring and so more. It is easy to spend few hours wandering around and enjoying a meal and a drink in the old town city center without feeling the time passing. Just outside the old town starts the ‘new nice city center’ that offers high end and souvenirs shopping options and many more restaurants, cafeterias and pizzeria. Place Massena is the most popular rendez-vous point in the city center and it is very close to the old town and easily reachable by walk from the Promenade des Anglais. It usually offer free entertaining options and an astonishing view. 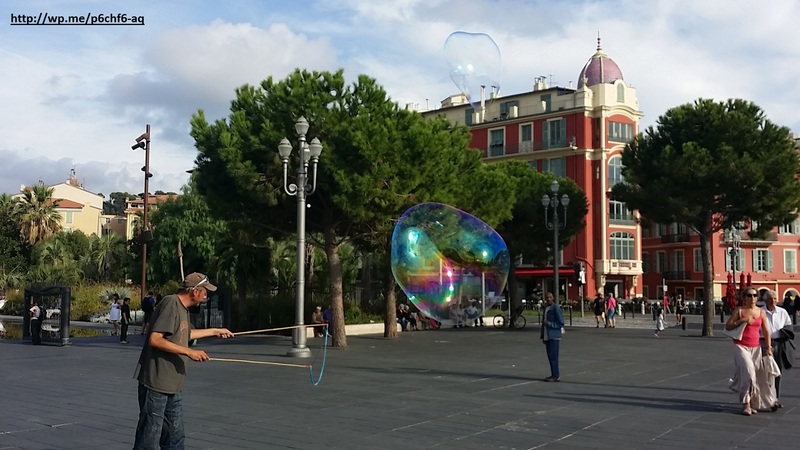 Place Massena is usually packed with street artist performing their art. Superb view of Nice surrounding hills from Place Massena. The wet area usually hosts fountain shows. There are still many things to write and say about Nice, but I stuck to what we have seen in that day only. 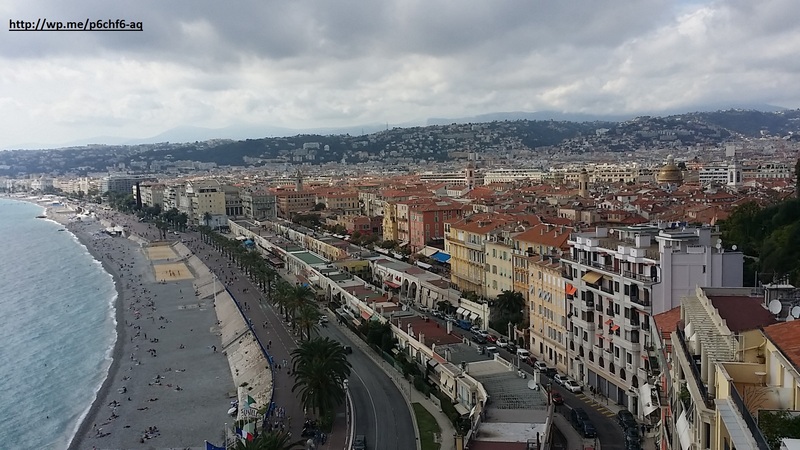 This entry was posted in Adventure, Exploring, France, Holiday and tagged Castle Hill, Cote d'Azur, Europe, explore, France, holiday, Nice, Old Town, Promenade des Anglais, Vieille Ville on November 12, 2015 by andreadetto. During our stay in Japan we tried each and every traditional dish we encountered on our way. We haven’t limited our exploration to the most popular ramen and sushi options and we included rice cakes, dried fish, matcha tea products and so on. In order to do so, we booked the hotel without any meal included to avoid the usual “international breakfast” you might find all over the world. Obviously, the first morning we woke up in the Asian Country, we rushed to the nearest breakfast restaurant and ordered one of the “special” breakfast options (the menu was only in Japanese but luckily was provided with photos of the meals). If you are used to western food and taste, you might find the Japanese breakfast weird. We have got steamed rice, miso soup (made with green onions, seaweed, tofu and fermented soy beans paste), nori (dried seaweed), tsukemono (pickles) and natto (fermented soy beans) and a raw egg. Japanese breakfast in a common restaurant in Tokyo. Natto (the fermented soy beans) can be disgusting for someone. Since I didn’t know what to do or how to combine the food together, considering that no one was speaking English in the restaurant, I had to learn from another customer how to deal with the food I had in front of me. so I added some soy sauce to the natto, I had the miso soup with the spring onions and some rice with the nori. I was enjoying my breakfast when I saw the other customer breaking the raw egg on top of the rice and enjoying it. My partner stopped eating while I managed to have the unusual mix. But the worst moment was when we had to eat natto. The taste itself is not bad, but the consistency and texture of the mix is weird. The fermented soybeans are covered by a filamentous and sticky jelly that resembles something really unpleasant. Again, my partner gave up at the first bite, I struggled to have a second. I had to drink an entire glass of iced barely tea to cancel the fastidious sensation from my mouth. Needless to say that we have opted for a somehow more suitable breakfast option during the rest of our holiday.The service was nice and the food came quick because precooked and ready to eat. Even though it is based on a fast-food philosophy, the quality of the food was good enough. Funny start of our holiday. This entry was posted in Breakfast, Food, Food Explorer, Holiday, Japanese food, Tokyo, Travel and tagged Breakfast, explore, Food, food lovers, Foodaholic, holiday, Japan, Japanese Breakfast, Japanese Food, miso soup, natto, nori, raw egg, seaweed, soy beans, Sukiya Takeshiba, Tokyo on August 25, 2015 by andreadetto. Visiting Japan is one of the easiest things to do. Either you want to visit a single city or travel around the Country, you have a countless number of transportation options that sometimes could seem even embarrassing. The railway network is impressive. Compared to the old one I have back home, a single line railway from Ventimiglia to Genova built around the end of the 19th Century, it seemed to me to have landed on an alien planet. Tokyo is probably the most densely populated city in the world and it would have been a collective suicide to force 30 million people to use their cars and motorbikes to commute every day. 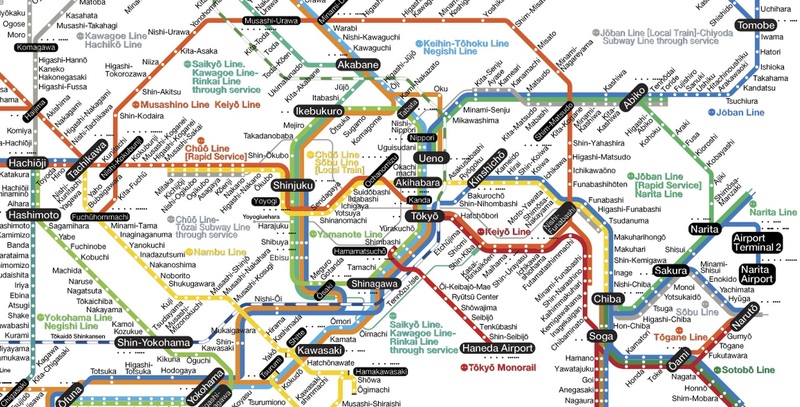 For this reason, Tokyo has a capillary public transportation that easily connects each and every part of the city. There are several levels and options available for citizens and visitors: subway lines, railways, boats trips, monorails and more. The main railway that you are going to use during your stay in Tokyo is the JR Yamamote Line. 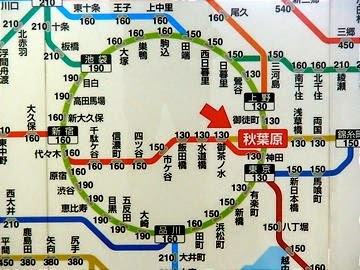 It is a loop line that connect Tokyo Station with many tourist places and network nodes such as, but not limited to, Akihabara, Shinjuku, Hamamatsucho (the connection with the airport monorail), Shibuya and more as shown in the below photo. The capillary JR network in Tokyo. In green at the centre, the Yamamote Line. In red the Haneda Airport monorail. If you would like to explorer Japan further, maybe adding Kyoto, Hiroshima or other cities to your itinerary, you do not have to worry. Japan is famous for the JR Shinkansen lines, particular railways where special trains (known as bullet trains) can travel at almost 300 km/h, rendering a trip Tokyo/Kyoto of almost 470 km a pleasant journey of less than 2 hours. It connects all Japan in a efficient and comfortable way, making your exploring the whole Country really easy. The JR group is the biggest in the Country and serves all the major cities. The next question is: How much does the public transportation cost in Japan? In all the stations you will find signboards with the fare to pay, if you do not have a JR pass. The answer is very simple:a lot since they are very expensive, especially the Shinkansen rides. In the train stations you will find sign boards with the fare to pay for a single ride from the current station (in this case Tokyo Station) to your destination. As shown in the photo, a one-way ride to the next station, costs in average some 130 Yen (more than 1 USD at today’s rate). There are daily passes available for the JR lines only (the Tokunai Pass – 700 Yen) or for all the lines (the Tokyo Free Kippu – 1,590 YEN). We took an average of 6 rides per day in Tokyo, in order to visit different districts in one day and without the JR Pass, getting the daily pass would have been a wise idea. The Shinkanses is quite expensive, with a ride from Tokyo to Kyoto at around 14,000 Yen (almost 120 USD) and a train trip from Nagoya to Takayama is almost 6,000 Yen (around 50 USD) just to mention two popular destinations that we have visited. Just to have an idea, during our stay we visited Tokyo (4 days), Nagoya (2 days), Kyoto (2 days), Nara (1 day) and Katayama (2 days) inclusive of all the Shinkansen connections we had to take. We estimated a total transportation cost of more than 65,000 Yen (around 540 USD) in order to visit the mentioned cities. Luckily enough, the Japanese government gives to foreign visitors the possibility to get a JR PASS valid on all the JR lines at the cost of 29,110 YEN (242 USD) for 7 days and 46,390 YEN (386 USD) for 14 days (regular class, seat not reserved). It is not valid outside the JR circuit that, however, is enough to allow you to visit Tokyo and Japan without trouble, limiting at few times the need to use a subway or a different way of transportation. With the JR PASS we saved some money (around 160 USD each) and a lot of time. In fact, the pass holders are just requested to show it at the gates, without the need to continuously go to the tickets office and buy a ticket. Note: The JR PASS shall be bought before going to Japan because it can be purchased only outside the Country by foreigners that will be enjoying a temporary Visit/Tourist Visa only. The JR Exchange Order shall be bought outside Japan and converted with the Pass at a JR point. The process is very simple. You shall buy a JR Exchange Order (see photo) either online or from an authorized travel agent. 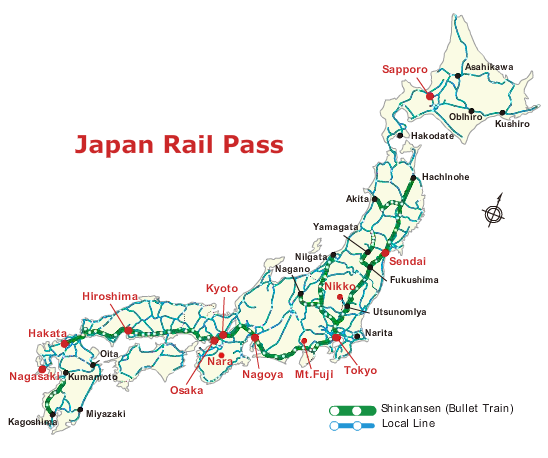 There are many website offering this option, the most complete of which is definitely www.japanrailpass.net/en/ where all the possible information you might require are available. Once you receive the JR Exchange Order, you shall exchange it with the actual Pass that can be obtained in the Airports and in the major Train stations. Just note that the appointed JR offices close at 18.30, hence you might be prevented to get your pass if you land after this time. The JR Pass you can get once in Japan. It will allow you to use unlimited JR trains inclusive of the Shinkansen. We landed at 23.35 at Tokyo Haneda Airport and had to buy a monorail ticket to reach Hamamatsucho Station (the first stop and also where we booked our hotel Bayside Hotel Azur Takeshiba). 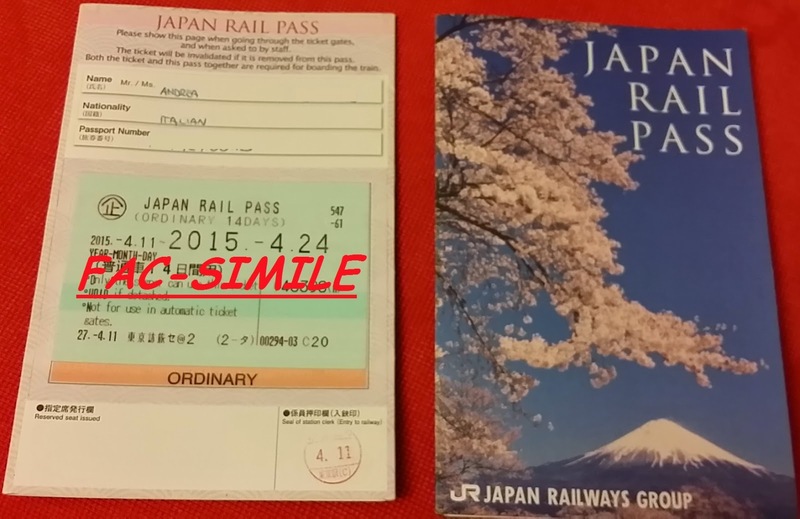 We were then forced to go to Tokyo Station the day after (paying again the ticket) and finally get the JR Pass issued. This entry was posted in Asia, Holiday, Japan, Public Transportation, Travel, Visit Asia and tagged asia, Bullet Train, holiday, Japan, Japan Rail, JR, JR Pass, Kyoto, Nagoya, Shinkansen, Tokyo, Transporation in Japan, travel, tricks on August 24, 2015 by andreadetto. If you are planning to visit Tokyo and from there visit some other areas of Japan, you might be asked to chose between two possible airports: Narita and Haneda. Narita is the new international airport and it seems to be exceptionally designed. I have a couple of friends that flew to Narita and they all said the same: great airport but it is 40 minutes by train from the City. By chance we had to fly to Haneda, the former principal airport and now the reference point for domestic flights and some selected international ones. The airport is extraordinarily close to the city that could be reached in 10 minutes with the available monorail, which links the airport with Hamamatsucho Station where the Yamamote Line (a circular JR line that connects almost all Tokyo neighborhoods), other JR Lines and subways are easily reachable. We flew from Dubai to Tokyo with Emirates and landed in Haneda whose arrival terminal is very minimal but efficient. Indeed, we landed, passed through immigration and collected our baggage in less than 20 minutes. A high speed WiF is also available, which I successfully used to call home with Skype without any trouble. The Airport staff are very polite and available to offer information and indication and almost all of them speak English in a suitable way (rare thing in Japan). The departure terminal is al-right with a check-in process efficient even though not really as fast as expected. Compared to Emirates Terminal 3 in Dubai, Haneda seems really small, however, it offers enough souvenirs shops and restaurants to spend easily 1 or 2 hours while waiting for boarding. just note that some shops close at 10 p.m., hence you might miss that nice bag you wanted to buy “after a quick bite” as we did. The monorail is perfectly integrated in the airport and is easy to reach. Note that since it is operated by JR you can use your JR Pass to access it. However, if you have bought a JR Exchange Order in advance and need to exchange it with the real Pass, remember that the JR office in Haneda Airport closes at 18.30 Tokyo time and you will be asked to pay for the monorail ride if you land after that time. The use of the JR Pass can seem quite complicated and its high cost can discourage from buying it but it is a valuable tool if you plan to visit more than Tokyo. This detailed JR Pass guide shows you hot it works. This entry was posted in Asia, Holiday, Japan, Tokyo, Travel, Visit Asia and tagged Airport, Airport Review, asia, Haneda Airport, holiday, Japan, Tokyo, travel on August 23, 2015 by andreadetto.